Trusted Car Sale – Trusted Sale – Safe Interactions. Secure Transactions. All you need is a valid drivers license, smartphone and email address to sign up for your FREE Trusted Sale account in less then 2 minutes! Enter your VIN or select make, model, mileage, price, and additional selling features and we will build you a professional vehicle detail page, instantly. Stand out from the crowd by adding a free vehicle history report, buyer financing, and share your page everywhere; we work on all marketplaces and classified sites. Verify buyer identities before you meet, and accept secure digital payments, directly into your bank account. We even create a legal bill of sale for both parties upon completion. 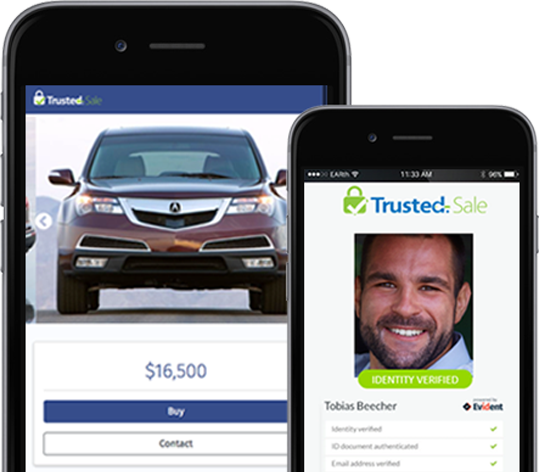 Trusted Sale allows you to sell any vehicle safely & easily, eliminating the need for cash/checks or lowball dealer trade-in’s. Our platform is powered by leading anti-fraud and digital payment technology, to ensure successful and profitable transactions, every time.